Nearly half of the June 19th edition of the BBC World Service radio programme ‘The Cultural Frontline’ was devoted to the topic of Lebanon’s boycott of the film ‘Wonder Woman’. 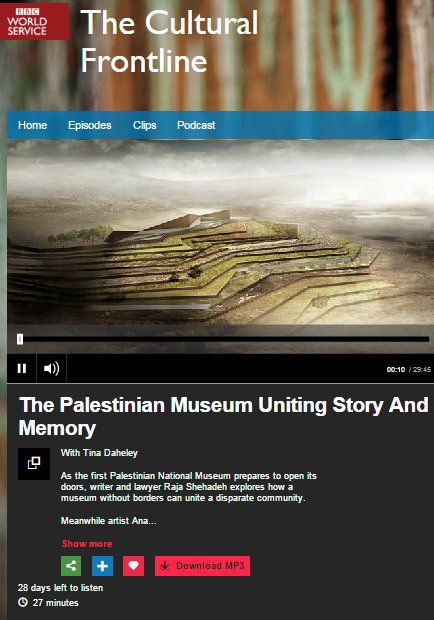 The item itself (from 01:18 here) began with Daheley promoting the usual – but inaccurate – BBC mantra according to which the Arab-Israeli conflict has its roots in the events of June 1967. Daheley failed to provide any relevant context concerning the causes of that war. Especially in light of Daheley’s introduction to the item, the fact that Lebanon’s law mandating a boycott of Israel was passed twelve years before the Six Day War took place should of course have been clarified, as should the fact that the law applies to more than “Israeli products and exports” and even forbids contact with individuals. Listeners then heard four anonymous ‘man in the street’ interviews that were also promoted separately by the BBC on social media. Daheley next introduced her first interviewee – “Halim Shebaya; a political analyst at the School of Arts and Sciences at the Lebanese American University”. Listeners were not informed that the 2006 conflict in Lebanon in fact began because the Lebanese terror group Hizballah conducted a cross-border raid and attacked civilian Israeli communities with missiles or that the 2014 conflict in Gaza was sparked by the terror group Hamas’ missile fire on Israeli civilians and construction of cross-border attack tunnels. Significantly, Daheley made no effort to challenge that inaccurate representation of the BDS campaign and failed to clarify to listeners that its aim is not ‘peace and justice’ but the eradication of Jewish self-determination in the State of Israel. Daheley then introduced her second interviewee – ostensibly brought in to give an alternative view of the topic. Pasha’s main point was not that a boycott is wrong or racist, but that it is ineffective. Pasha went on to claim that “the best way to help the Palestinian people is for more people who are sympathetic to their position […] to come to Hollywood”, later adding that fighting “for the Palestinian cause […] is what I do here”. He introduced the unrelated topic of South Africa into the discussion. Worldwide listeners to this programme obviously did not hear two opposing opinions on the topic of this latest manifestation of anti-Israel boycotts. What they heard instead was like-minded people debating the technical merits of a boycott campaign (directed at a person solely because of her nationality and ethnicity) rather than its content. This is of course by no means the first time that the BBC has provided an unchallenged platform for supporters of the anti-Israel, anti-peace BDS campaign without clarification of its real agenda and in the past, BBC audiences have even seen that campaign misrepresented as a ‘human rights’ organisation. Moreover, the BBC claimed in 2015 that it is “not our role” to inform audiences to what the campaigners to whom it regularly gives airtime and column space actually aspire. And thus – as this latest example once again shows – the BBC continues its policy of mainstreaming an aggressive political campaign that both targets individuals on the basis of their religion and ethnicity and aims to deny the right of self-determination to one particular ethnic group. Seeing as some of Zand’s questions were clearly intended to prompt responses relating to Israel, it is interesting to take a look at the unchallenged impressions of that country received by audiences. For example, listeners were informed that Israelis “don’t have much of a history”. Audiences also heard that one “cannot avoid propaganda” in Israel. Audiences were inaccurately informed that Haifa is the only place in which Jews and Arabs live together. And listeners also learned that the Israeli media ‘glorifies death’. Clearly this item intended for “international audiences” did not meet those standards. Listeners actually hear very little in the way of a coherent explanation about the types of “stereotypes” and “clichés” which are supposedly challenged. However, the absence of any effort to introduce context into this item means that in fact listeners have quite a few of the “stereotypes” and “clichés” which make up a particular political narrative reinforced. ‘The Cultural Frontline’ describes itself as a programme “where arts and news collide”. Not for the first time, this item clearly did nothing to contribute to meeting the BBC’s remit of enhancing audience understanding of the current affairs issue to which it relates. The August 28th edition of the BBC World Service radio programme ‘The Cultural Frontline’ included an interview (from 07:04 here) with British street artist Joy Gilleard. A specific edited segment of that interview was also separately promoted on Twitter. Given the fact that portrayal of Jesus as a Palestinian is one of the tactics long employed by anti-Israel campaigners attempting to negate and erase Jewish history, one might have thought that the programme’s presenter Sahar Zand would have taken the trouble to make listeners aware of the ahistorical politics behind the portrayal of the Virgin Mary as a Palestinian – if only for the sake of editorial standards of accuracy and impartiality. However, the representative of a media organisation which earlier this year spent a significant amount of airtime discussing the alleged cultural appropriation of a pop star’s hair style, stayed silent. Listeners to the March 26th/27th edition of the BBC World Service programme ‘The Cultural Frontline’ heard a long item (from 20:17 here) which presented a caricature of Israel and Israeli Jews from Arab lands which is rife with subtly misleading inaccuracy and omission. An abridged version of the item was promoted separately on social media. Longtime readers of the Guardian will of course be familiar with Khaled Diab: he has after all been promoting his ‘one-stater’ ideas on its pages for years and he is the man who, in 2009, tried to persuade them that the solution to the Arab-Israeli conflict ought to be modelled on his adopted homeland of Belgium – an idea which might currently seem even less plausible than it did at the time. So far, so good but then Diab goes on to make the following assertion about a country in which Arabic is one of two official languages and everything from passports and ID cards to food packaging displays Arabic script – including the signs Diab presumably saw when he first stepped off the plane. Diab does not elaborate on that last sentence and the significance of his sidestepping of events such as the Farhud in 1941 or the pogroms in Libya in 1945 will later become apparent. Whilst there is no denying the cultural clashes of Israel’s early years, that simplistic caricature erases from audience view the topic of the process of building of a national identity in the formative years of the Jewish state (and its satirisation in works such as the 1964 film Sallah Shabati which garnered unprecedented box-office success at the time) and the work of people such as Abraham Zvi Idelsohn (author of the Thesaurus of Hebrew Oriental Melodies), Shoshana Damari and Sara Levi-Tanai. “In the beginning of the 1950s, they decided to leave Baghdad and join the big wave of emigration from Iraq to the newly-established Israel. In spite of their wealth and of the wide range of possibilities before them Saleh and Daud had to leave everything behind. They emigrated to the young Jewish state without using their connections to gain permission to take their property with them. An Arabic orchestra belonging to Israel’s state-run radio? An Arabic channel run by the same official radio station? That of course is a very different picture to the one painted by Khaled Diab who would have listeners believe that such culture was “shunned and looked down on” by the “Ashkenazi establishment” but indeed the state-run ‘Voice of Israel’ radio station did have an in-house Arab orchestra from 1948 until 1993. Diab does not clarify what he means by “recent” but obviously his definition is somewhat different to that of the dictionary given that in 1971 the Israeli Broadcasting Authority produced the first Mizrahi song festival which was aired on radio and screened on television. Apparently he has never heard of Zohar Argov’s smash hit ‘The Flower in my Garden’ from 1982. Diab goes on to tell listeners that “numerous young artists have reclaimed the Iraqi, Yemeni and North African music of their ancestors” before moving along the route to his core agenda. Audiences might have been somewhat less bewildered had Diab told them that Nasreen Qadri is an Arab-Israeli born and raised in Haifa. Had he done so, however, the use of the word “occupier” in his next sentence would obviously have required explanation. Diab provides no source or evidence for his claims of ‘marginalisation’ and makes no attempt to clarify to listeners how that process ostensibly takes place. But propagation of the notion of an ‘Ashkenazi elite’ – despite the fact that increasing numbers of Israelis have mixed Ashkenazi and Sephardi or Mizrahi heritage and that Mizrahim are to be found in prominent positions in all fields of Israeli society – serves Diab’s ultimate take-away messaging. In addition to the fact that yet again Diab brings no evidence to support his claim of a “surge in anti-Arab racism” among Mizrahim, it is very obvious that since he first began banging this particular drum in an article titled “Israel’s other Arabs” published seven years ago at the Guardian, he has done nothing to inform himself of the circumstances and background to the mass exodus of almost a million Jews from Arab and Muslim lands – and the related collective memories of Mizrahi and Sephardi Jews. Whilst we would of course expect nothing better from such a seasoned polemicist as Khaled Diab, it is however regrettable that the BBC World Service elected to give such a generous platform to his recycled, uninformed and politicized caricature of Israel and Israeli Jews from Arab lands which not only does nothing to meet the corporation’s remit of enhancing audience understanding of “international issues” and “different cultures from around the world” but actively – and intentionally – hinders such understanding. Between December 31st 2015 and February 22nd 2016, assorted BBC platforms produced five separate reports or programmes which falsely described a certain book as having been ‘banned’ by the Israeli government. On March 13th inaccurate information concerning that book – Dorit Rabinyan’s novel ‘Borderlife’ – was once again promoted in an item appearing in the BBC World Service radio programme ‘The Cultural Frontline’. Gundar-Goshen’s account concerns a controversy which arose last month when an Arabic language version of a book by an Israeli journalist was discovered at the Cairo International Book Fair. Despite having told listeners that among the books available in Egyptian book stores are ‘Mein Kampf’ and the antisemitic forgery ‘Protocols of the Elders of Zion’, Gundar-Goshen nevertheless claimed that the Egyptian cultural scene “refuses any normalisation with the Israeli state due to the Israeli occupation of Palestine”. The book ‘Borderlife’ was not ‘banned’ from the school curriculum: it was not included in a list of books upon which high school students will be examined for their GCSE equivalent certificate in literature. The BBC’s repeated misrepresentation of Dorit Rabinyan’s book as having been ‘banned’ is by now far too recurrent to be excused as a mere error. That falsehood has been serially promoted over the last two and a half months, with BBC audiences being repeatedly herded towards the inaccurate and politically motivated narrative of a dark Israeli regime which bans books on ideological grounds. In recent weeks inaccurate and misleading information concerning Temple Mount has been promoted on a variety of BBC platforms. On domestic and worldwide radio, as well as on television and the BBC News website, audiences have been led to believe that the entire Temple Mount is ‘al Aqsa Mosque’ and that the site (which has religious significance to all three Abrahamic religions) is exclusively “Islamic” or “Muslim”. The latest example of promotion of inaccurate information relating to that topic came in a new BBC World Service radio programme called ‘The Cultural Frontline’ which, listeners are told, is “the line where arts and news collide”. Obviously, for there to be “tensions over control of a Jerusalem mosque”, more than one party must be seeking to control that mosque and that, of course, is not an accurate representation of the situation. Not only does Israel have no interest in seeking “control” of al Aqsa Mosque, but it has repeatedly stated that it will continue to uphold the status quo whereby that building and the wider area of Temple Mount is under the administrative control of the Jordanian Waqf. But not only does Daheley’s claim materially mislead listeners by providing them with an inaccurate explanation for the surge in violent rioting and terrorism; it also conceals their real cause – and agenda – by diverting listeners from the incitement based on conspiracy theories concerning al Aqsa Mosque which really does underpin that “serious violence”. Let’s hope that future programmes in this series will pay more attention to the importance of accurate terminology.